US Art Supply - 100 Mega Count Washable Marker Set Just $13 Down From $40! You are here: Home / Great Deals / Amazon Deals / US Art Supply – 100 Mega Count Washable Marker Set Just $13 Down From $40! US Art Supply – 100 Mega Count Washable Marker Set Just $13 Down From $40! Here’s another great Christmas gift idea! 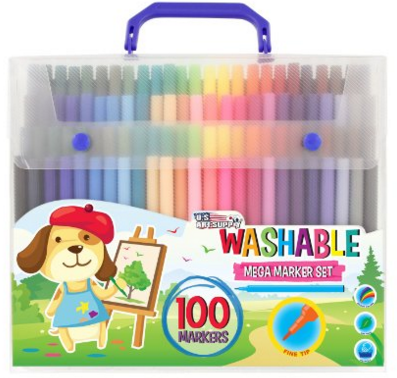 US Art Supply – 100 Mega Count Washable Marker Set is just $13 down from $40 on Amazon! Get yours now while it lasts! 100 COUNT WASHABLE MARKER SET: Mega Set of 100 Long lasting and durable fine tip washable markers in vibrant and bold colors. Excellent for kids to use for writing, drawing, coloring and doodling. The vibrant inks do not smudge or bleed through most paper. Comes in a convenient organizer carrying case, so you can keep all your markers neatly organized and ready for use. RISK FREE PURCHASE – 100% LIFETIME SATISFACTION GUARANTEE: We’re so confident that you’ll be delighted with our washable markers that if you’re not satisfied with them at anytime, we’ll provide a full refund.